Southern Europe, in the Iberian Peninsula. 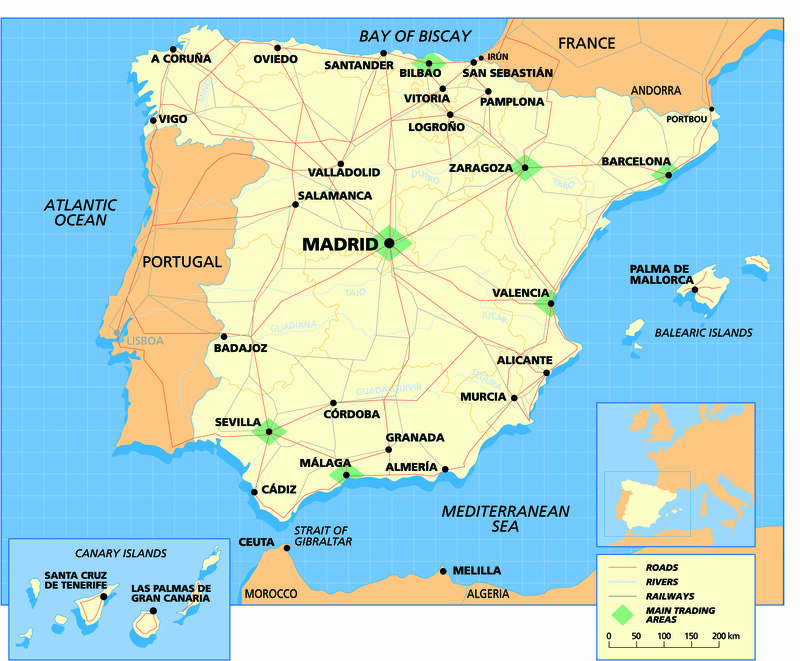 In addition to the mainland, Spain includes the Balearic Islands in the Mediterranean Sea, the cities of Ceuta and Melilla in North Africa and the Canary Islands in Atlantic Ocean. Copper, zinc, lead, potashes, gypsum, sepiolite (meerschaum), sodium sulfate, ornamental stones, arable land. 46,539,026 inhabitants (as of 1 January 2017). 9.8% of the population is foreign. The most numerous nationalities in this groups are Moroccans with 1.61%, Romanians with 1.47% and British with 0.51%. Catholic – 70%; other religion – 2.8%. Castilian Spanish is the official language throughout Spain. There are other Spanish languages that are also official according to the statutes in their respective Autonomous Regions. English is the most widely-studied foreign language. Citizens of other European Union States, Switzerland, Norway, Iceland and Liechtenstein; valid National Identity Document or passport. Citizens of the rest of the world also require a visa. For more information: www.exteriores.gob.es. 17 autonomous communities, 50 provinces and 2 autonomous cities, Ceuta and Melilla.